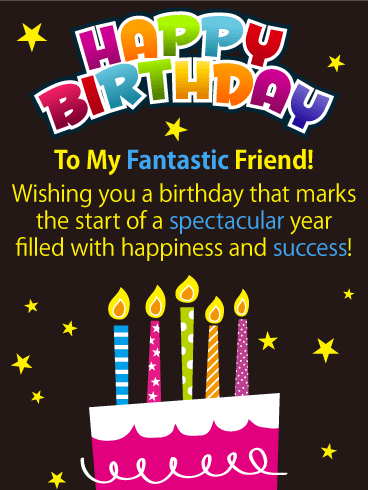 Wish your fantastic friend a happy birthday with this vibrantly colored birthday card! It will make them wish their birthday was every day! It contains bright colors of pink, yellow, and blue, which look great against the black background! 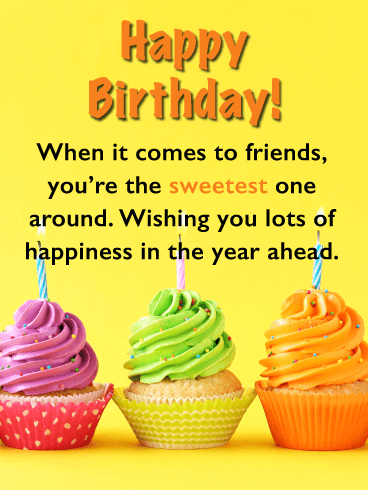 Your friend will appreciate that you are sending them a birthday card that wishes them a spectacular year filled with happiness and success. What more could a friend ask for in a birthday card! This touching birthday card will have your friend reaching for the phone to call you. It features a heartwarming message that tells them you knew from the first day that you would always be friends. Such a nice thing to say to someone on their birthday! It was designed with pretty shades of pink and lovely birthday candles sitting atop a birthday cake! 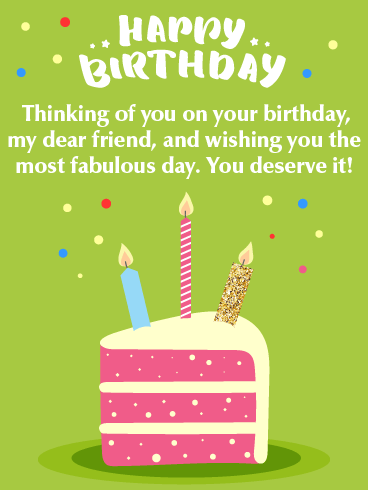 Send this great birthday card out soon so your friend will know how much you care! 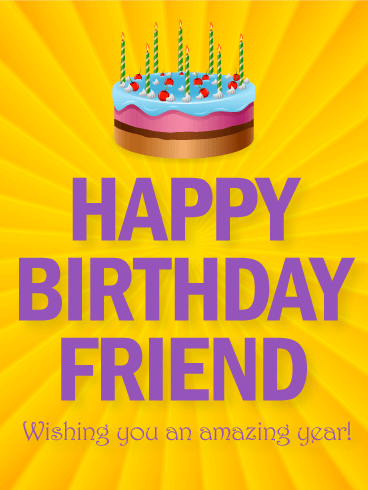 Send special birthday wishes over to your dear friend on their big day! 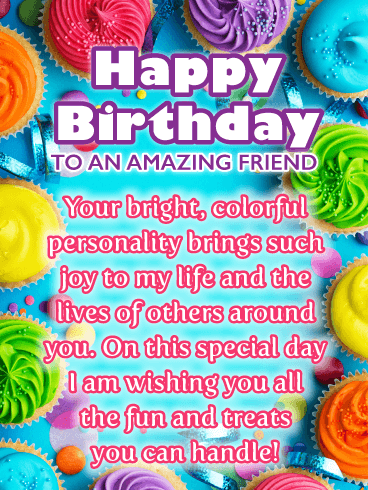 This colorful birthday card lets your friend know that you love spending time with them and that you feel they are a great friend. The festive birthday candles and the decorative lettering add an element of celebration to this awesome birthday card! 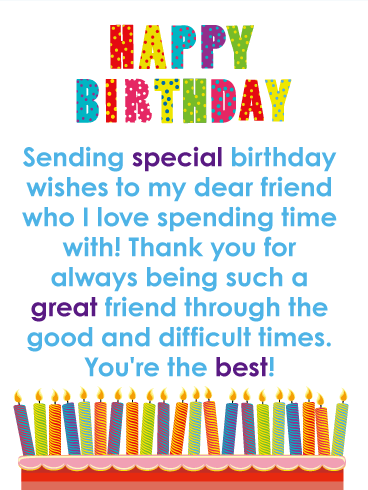 Send this greeting card now because it's time to wish your friend a happy birthday and let them know they are the best! 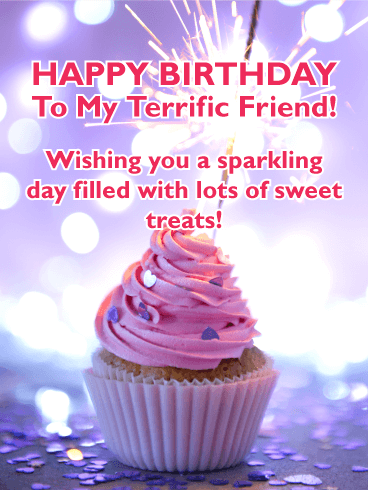 Add some excitement to your friends day with this spectacular sparkling cupcake birthday card! 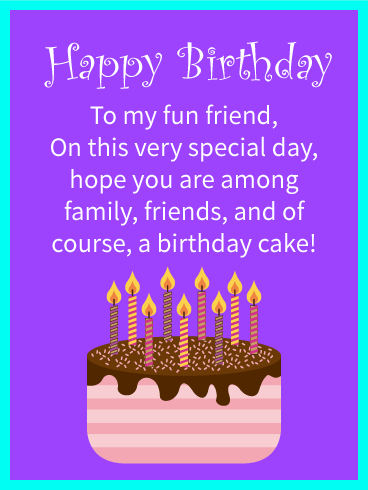 It features a dazzling purple background with twinkling lights that make this birthday card sensational! The cupcake displays perfect pink frosting and is surrounded by purple celebration confetti! 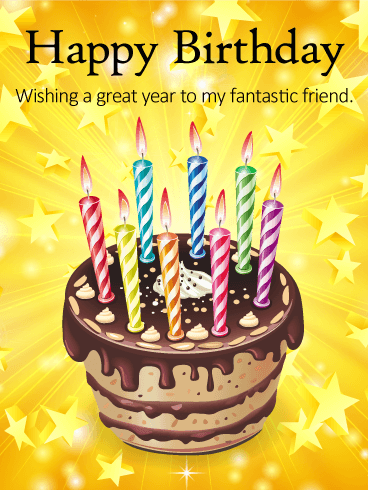 Send this fantastic birthday card to your friend so you can wish them a sparkling day filled with sweet treats. 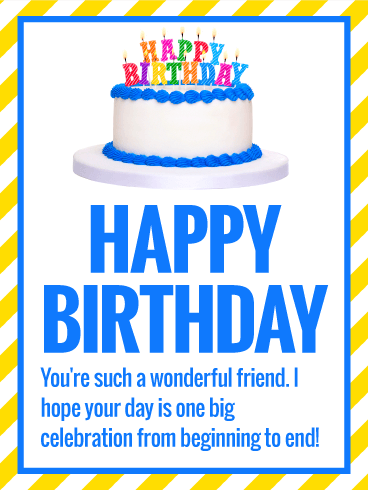 It will let your friend know you are thinking of them on their birthday! A glittery birthday cake is all you need to get your friend's birthday started in an exciting way! This elegant birthday card features an impressive decorative cake that will have your friend counting the hours until it's time for their real birthday cake! This greeting card will let your friend know that you are wishing them a joyous occasion and hope for the year ahead. It's the perfect birthday card for your friends special day. 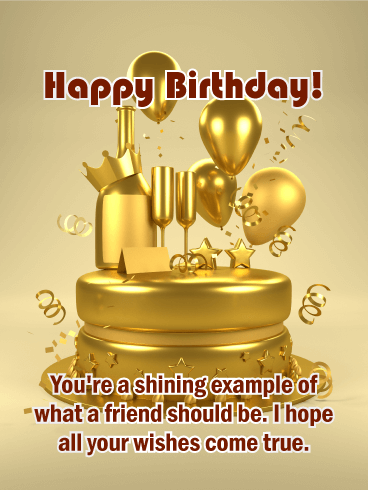 They say friendship is golden, and what better time to share that sentiment with a special friend that on their birthday! A glistening, golden cake is topped with balloons, Champagne and even a crown for a celebration that reigns supreme for someone who's the shining example of what a friend should be. Birthdays are for celebrating, but they are also a time to reflect on the past year and all the accomplishments that were achieved. 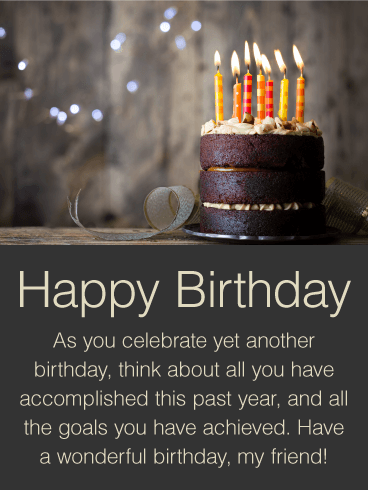 Let your friend know that they have a lot to celebrate this year, and that he or she is one year wiser. This reminder is like a birthday present in itself. 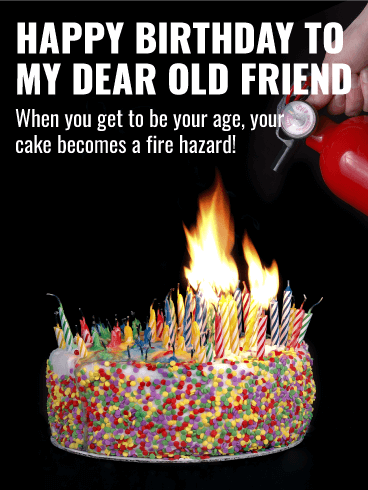 This conservative Happy Birthday card would be great for your personal friends, as well as your coworkers. 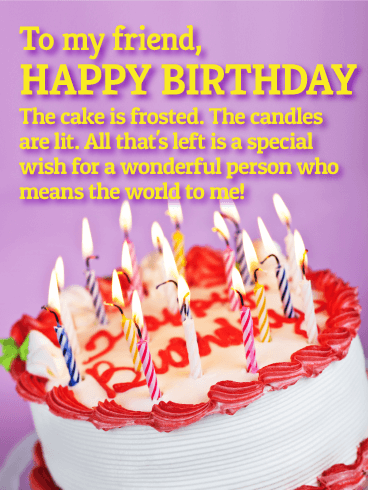 Colorful lit candles, yummy frosted cake, bright pink background, yep, this is a birthday card! You can't look at it without thinking "birthday"! 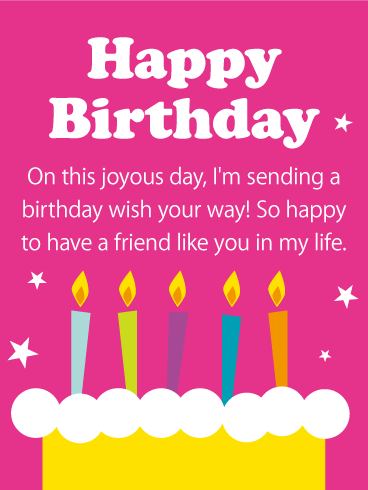 That's what makes this Happy Birthday card so great for sending to your friend on their birthday. 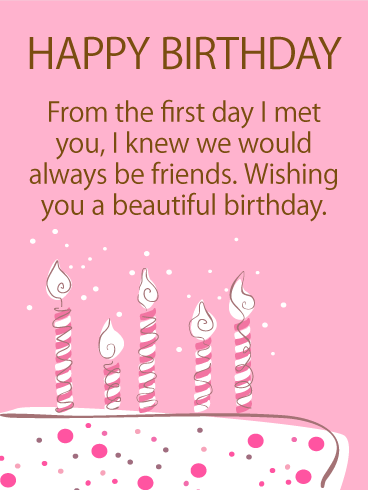 It will be sure to add joy to their day, so send this birthday card out without delay! What says birthday more than cake and presents! 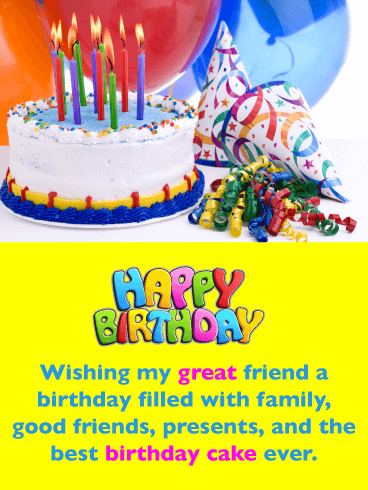 Wish your dear friend a Happy Birthday with this brightly colored birthday card. Everyone should have a cake that looks this good on their birthday! The celebration banner that runs across the top of this birthday card adds an element of excitement that will remind your friend that it's time to celebrate their birthday! This is the sweetest Happy Birthday card ever, and your friend is going to just love it! The cupcake features yummy white frosting with sprinkles, as well as some sparkle for that extra touch! Plus, the pink background with shimmering lights adds a magical element to this birthday card! 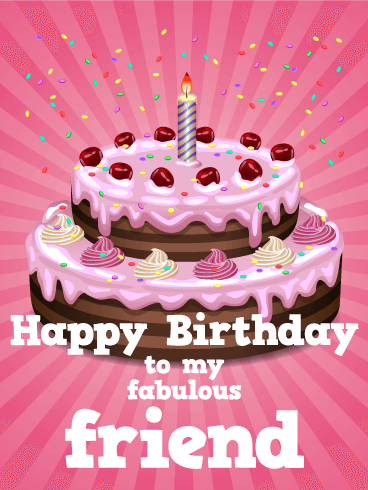 Make sure to send this cute birthday card over to your friend to add some sparkle to their day! Now this is a piece of cake that no one could resist! It looks perfect, especially with the unique party candles! 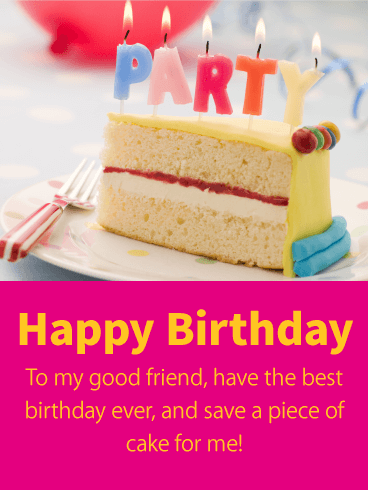 It will allow you to wish your friend the best birthday ever while reminding them to save a piece of birthday cake for you! 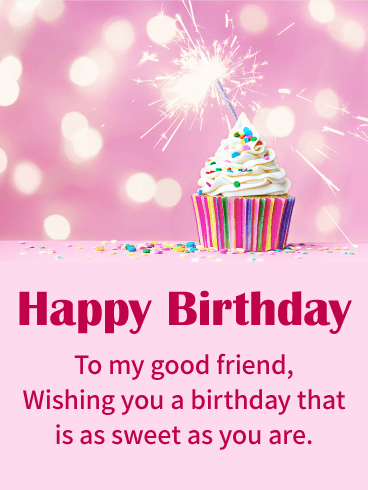 This bright and happy birthday card displays wonderful colors of pink, orange, blue, and yellow, making it a joyful birthday card that will add some happiness to your friend's birthday this year. 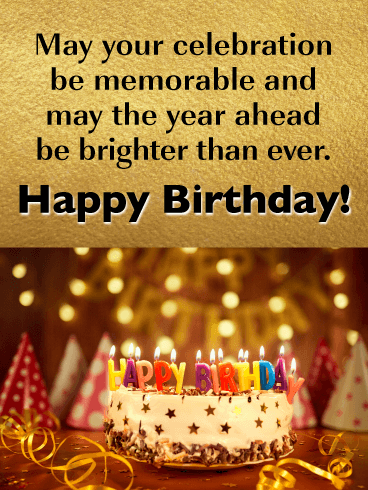 A great birthday cake will catch the attention of anyone, which makes this a wonderful Happy Birthday card to send over to your friend who is celebrating the best day of the year, their birthday! 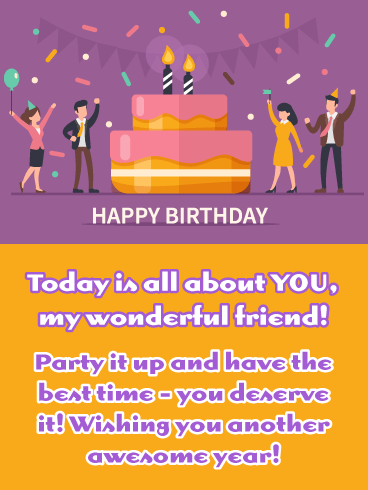 This birthday card will wish your fun friend a day filled with everything that would make a birthday complete; family, friends, and the best part, birthday. 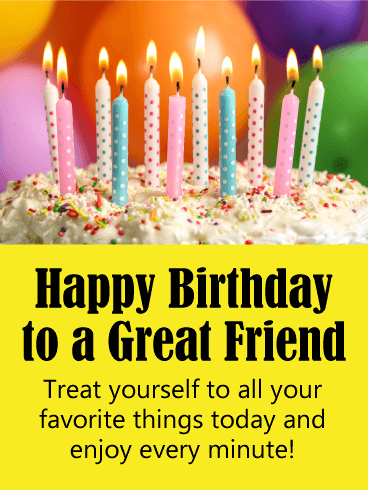 Great friends are worth celebrating every day, but especially on their birthday! 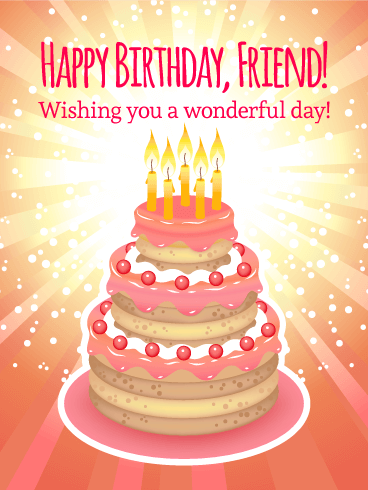 Wish your friend a very happy birthday with this yummy and bright cake card. 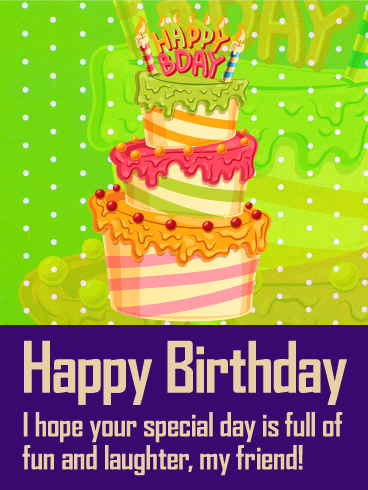 This birthday greeting card is delightfully colorful and super festive. Birthday candles invite them to make a wish and have a terrific day filled with all their favorite things. 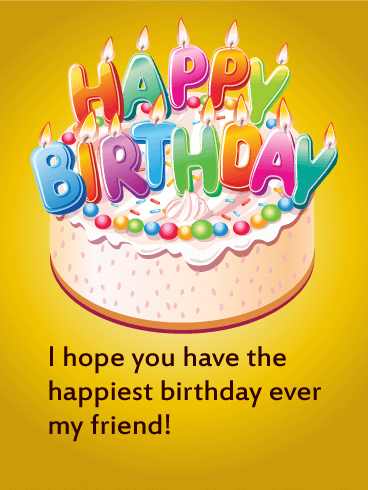 Send a cake and candle birthday card to your amazing friend today. Nothing is quite so festive as a slice of fun-fetti birthday cake! It's fun. It's confetti. It's fun-fetti! You're never too old to enjoy this delicious cake. 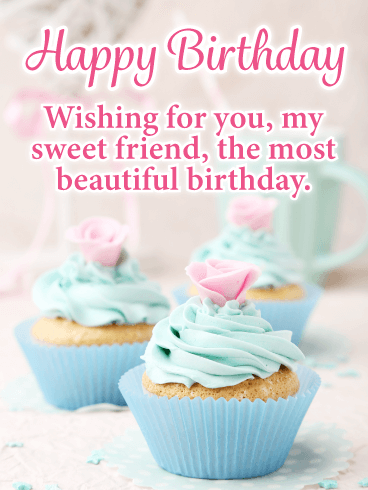 Wish your friend a happy birthday and a day of delights with this sweet birthday message. 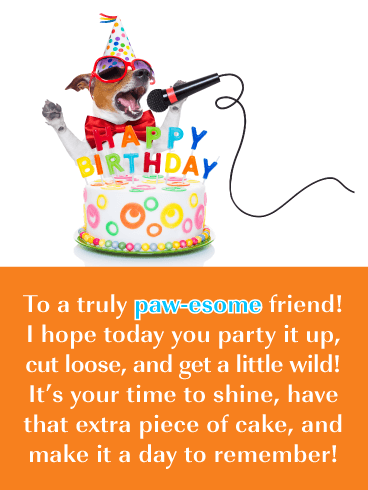 This birthday greeting card is yum-tastic and the perfect way to put a smile on your friend's face. Do you have a good friend who likes to joke about getting older? Then this is the perfect funny birthday card! A bright homemade birthday cake is just about to topple over under the weight and heat of so many birthday candles. In fact, it's going to take a fire extinguisher to set things right. 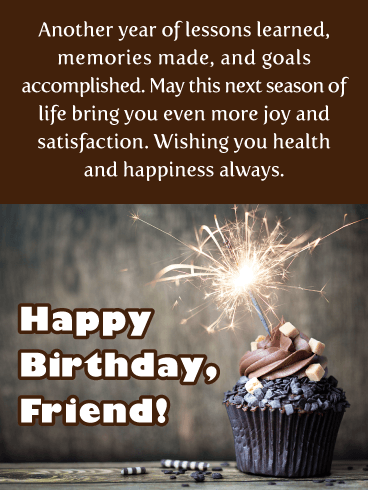 Your friend will get a kick out of this funny birthday card, but will also appreciate that your long-time friendship is a gift to treasure. 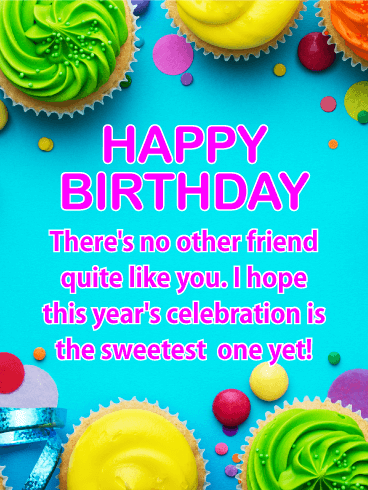 A sweet friend like yours deserves the sweetest wishes on their birthday! That's where this charming birthday card comes in. Playful pink stripes pop in the background, and at the center, a two-tiered cake that looks good enough to eat is topped with a single candle to help brighten their celebration. Below are your thoughtful words, which will touch their heart while making them feel loved and remembered. A colorful, candle-topped cake shines against a bright yellow background to help make this year's birthday special for a dear friend. This thoughtful birthday card is the perfect way to wish someone a day full of fun and celebrating, no matter what age they're turning. It's also a warm reminder that you're thinking of them and hoping they have "an amazing year ahead!" 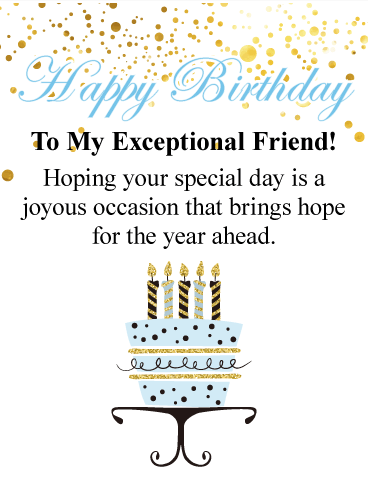 This sentimental birthday card for a special friend delivers your most heartfelt wishes. The festive cake on top is covered with candles, just waiting to be blown out, and the thoughtful message below adds to the joy surrounding this important celebration. It's a way to let them know that they mean everything to you, not only on their birthday but every day. 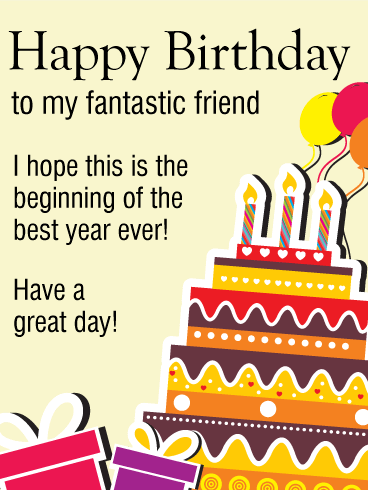 This cheerful birthday card is the best way to wish your good friend a sweet birthday celebration! A vibrant green background with little white polka dots sets a festive tone, while the four-tiered, brightly lit cake that sits front and center adds to the charm. Of course, the perfect finishing touch is your heartfelt message for a day "full of fun and laughter!" 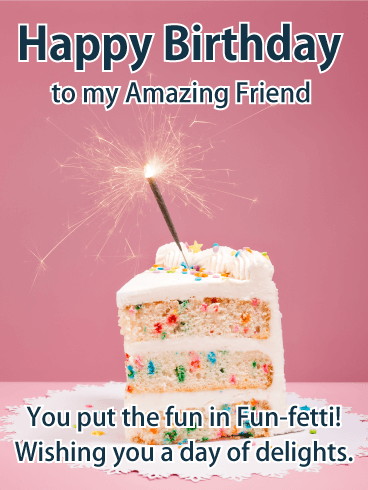 A friend as fantastic as yours deserves to be celebrated on their birthday...and this birthday card is a wonderful choice! A delicious-looking cake topped with brightly lit candles all around holds wishes for an amazing year ahead. The background is filled with stars, bringing an extra touch of magic to someone special who shines in your eyes each and every day! 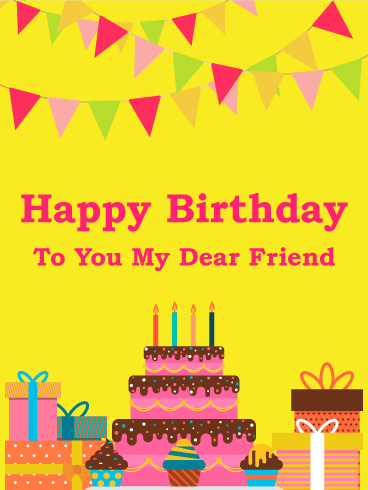 Is today your friend's birthday? Do you want to surprise them with a bright, colorful card while they work or celebrate? 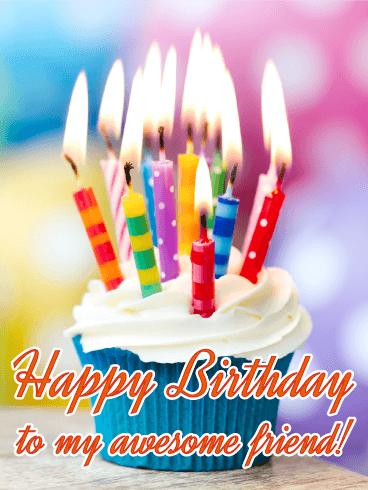 The yummy cupcake and colorful, lit candles on this Happy Birthday card are the perfect way to send your birthday wishes! The sweet message will tell your friend just how amazing they are and let them know that you're thinking of them on their special day! Cake! Frosting! Candles! Kick start a friend's birthday with the thought of cake and your Happy Birthday wishes. Make sure you wish them luck while blowing out the candles and do not wait to send a cake loving friend this delicious birthday card today! Hang out the party flags and light the birthday candles for your friends! It is time to celebrate that special someone who is always there for you. The delicious cake wishes a "Happy Birthday" to your best support. 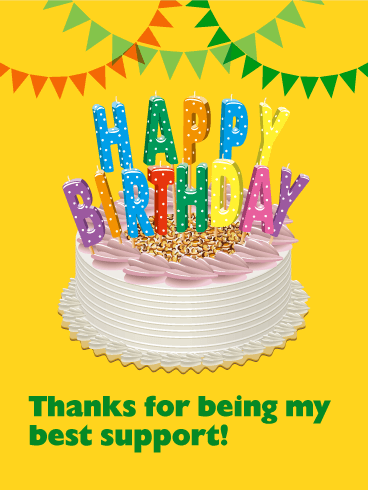 For a festive birthday greeting, send this cheery, yellow birthday card!